Coming to one of our fun events or camps at the gym? Coming to work out with your school team? Download our Guest Release Form at this LINK! Fill out the form and bring it with you to the gym! We can’t wait to work with you! To stay up to date with our latest offerings and events, sign up for our Newsletter at this LINK! We promise not to spam your inbox! But, we do promise to deliver great information about what’s happening at Champion about once a week! Don’t miss out! In accordance with the Carroll ISD and the Northwest ISD cancelling all after school activities, both Champion locations will be closed tonight due to the incoming inclement weather. Please stay home, stay weather alert, and stay safe! 2019-2020 All Star Elite Teams are Now Forming! 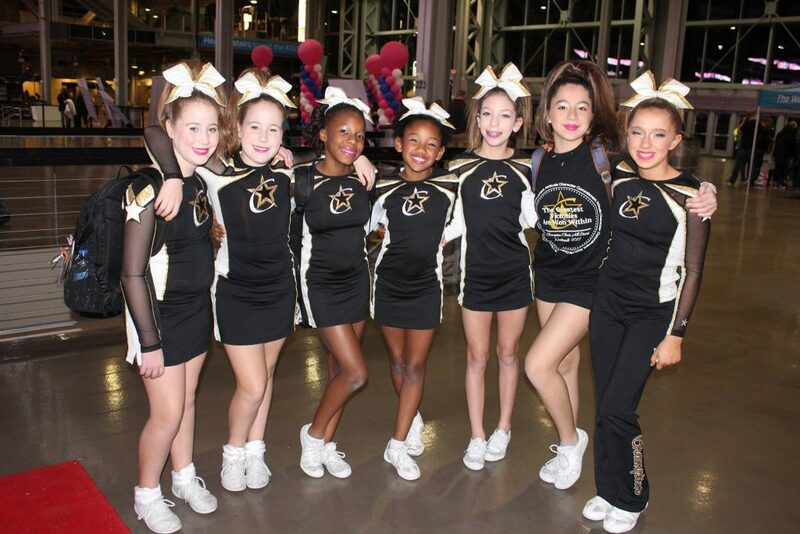 It is time to start forming All Star Elite teams for our 23rd Season! 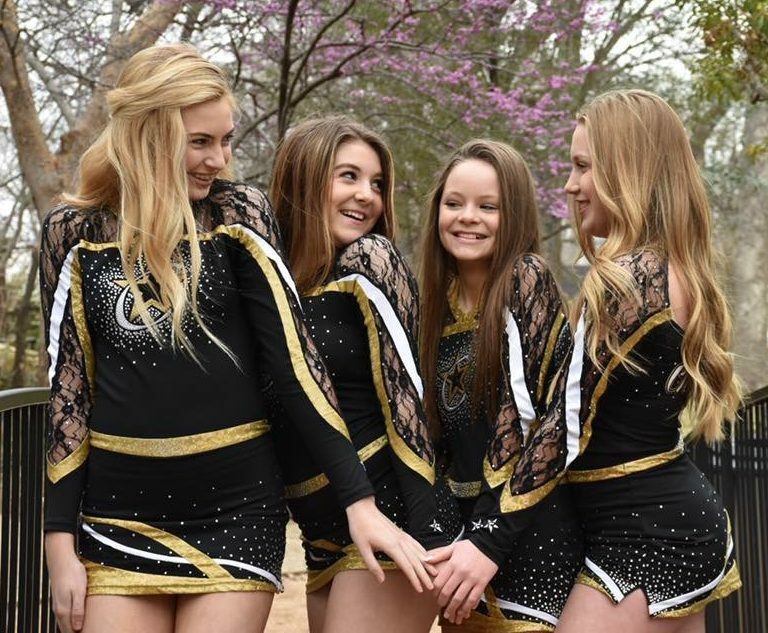 The 2019-2020 All Star Elite Team Information packet is now available at this link. Online registration is now open, too! Click through to our Parent Portal at this link. Simply choose between our Southlake location or our Justin location by selecting your preferred location in the drop down menu in the header bar and proceed with the online registration! You will also have the opportunity to tell us whether you want to be considered for teams at CCA Southlake only, CCA Justin only, or either location. Make sure to use the promotional code CCA23 to get a $35 discount on your evaluation fees simply by registering by Monday, April 15th! Along with our All Star Elite teams, we have All Star Prep teams and Novice teams at both locations giving a team option at varying commitment levels for all athletes. Information for those programs will be released soon! Please give us a call if you have any questions! For our Southlake location, call 817-251-1546. For our Justin location, call 940-206-4815. We look forward to another year of Building Champions for Life! 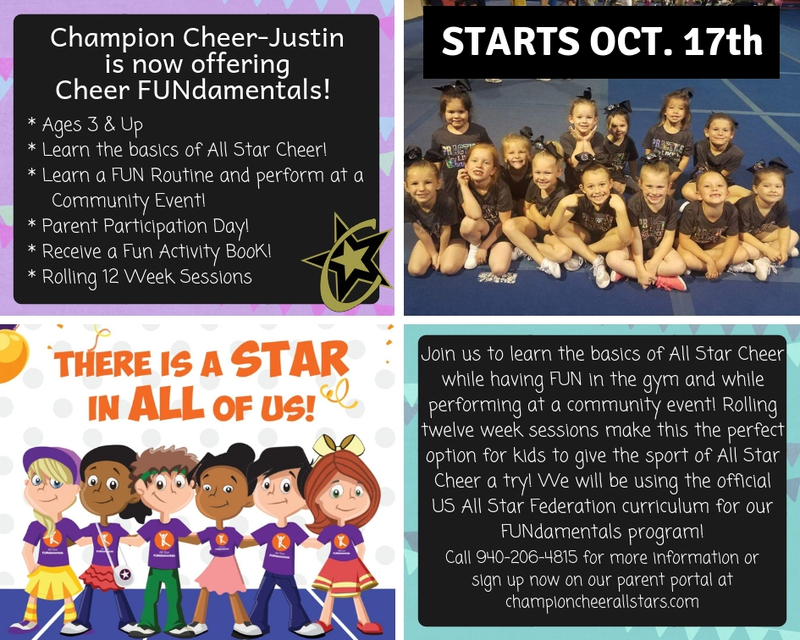 Champion Cheer Justin is now offering Cheer FUNdamentals, and registration is officially open! Join us to learn the basics of All Star Cheer while having FUN in the gym and while performing at a community event! 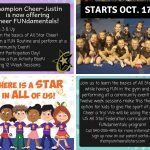 Rolling twelve week sessions make this the perfect option for kids to give the sport of All Star Cheer a try by getting involved in a team atmosphere with a smaller commitment! Our first session will be October 17th though January 24th. The team will be based at our Justin location and will practice on Wednesdays from 4:30-5:30 PM. Athletes in this session will be invited to our Gold Gala Showcase and will also perform at The Decatur Christmas parade on December 1st! You can enroll online in the Parent Portal on our website under camps! Register soon because practice begins October 17th! We can’t wait to see these Champions in training! Starburst Half Year Mini Team Registering Now! Registration for Starburst – our new half year Mini Novice Team is now open! Starburst is a half year Novice team for 5-8 year olds as of 8/31/18. The team will be based at our Southlake location and will practice on Mondays from 4:45-5:45 PM and Wednesdays from 4:30-5:30 PM from October 1st through April 7th. Starburst is our most introductory competitive team in which athletes can challenge, explore and elevate their skills in a low stress environment. They will compete at three local competitions in the Novice divisions which means they will be judged for ratings and awarded ribbons for Outstanding, Superior or Excellent. 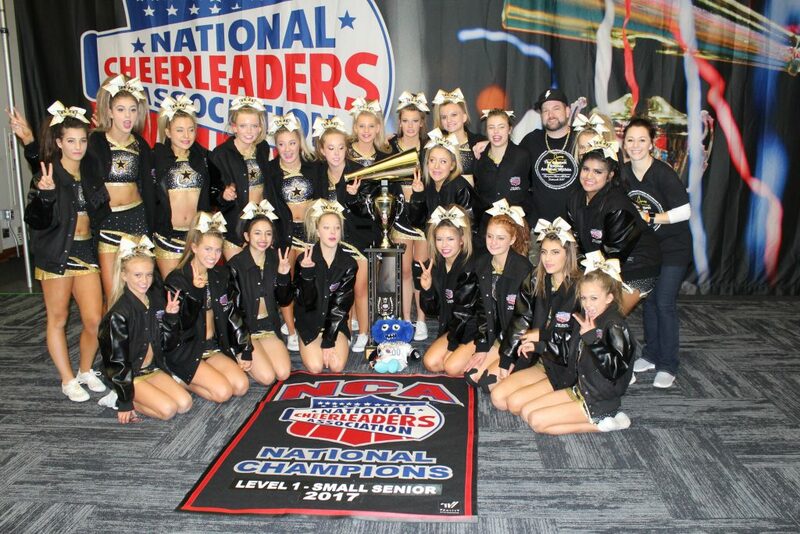 This team is perfect for those who would like to get started in competitive cheer now that summer vacations are over and school routines are set and for those who want a smaller commitment. For more information, you can download the full team information packet HERE. You can register for the team on our Parent Portal HERE. The first practice is Monday, October 1st, so register soon! If you prefer our location in the Justin/Haslet/Rhome area, their Mini Novice Team, CinderEllas, has a few openings left! Email Caitlin at caitlinsutphin.cca@gmail.com if you are interested! We look forward to a great season with our Novice athletes at both locations! Our Southlake Gym has a New Home!! Our new Southlake gym is now open!! All classes and team practices will now be held in our new building at 375 Commerce Street, Suite 200, Southlake. If you have questions, or issues finding us, please call the front desk at 817-251-1546. We are so excited to start making memories in our new gym! Please follow the instructions in the graphic below to keep traffic congestion down and our athletes safe. Please enter our parking lot from north bound Commerce Street. Turn right at the first entrance to our facility. Turn left through the one way drop off/pick up circle. Then, exit by turning right onto Commerce Street. Please DO NOT park in any neighboring lots of businesses that are open. We need to respect their business and customers, just as we would expect the same from them. For additional parking, there are a limited number of reserved spots for our immediate neighbors that open up at 6 PM and there is additional overflow parking at Mavich Marketing after 5PM. You may also park on certain parts of the street, but please be sure you are following all street signs. Please note that parking is never allowed at Portable Power Systems, regardless of the day or time. Thank you! We are now offering 2 options for rec tumbling classes this school year– Unlimited Tumbling, which offers great flexibility for busy schedules, or the Traditional One Class per week option, for those who prefer to have one designated tumbling session. 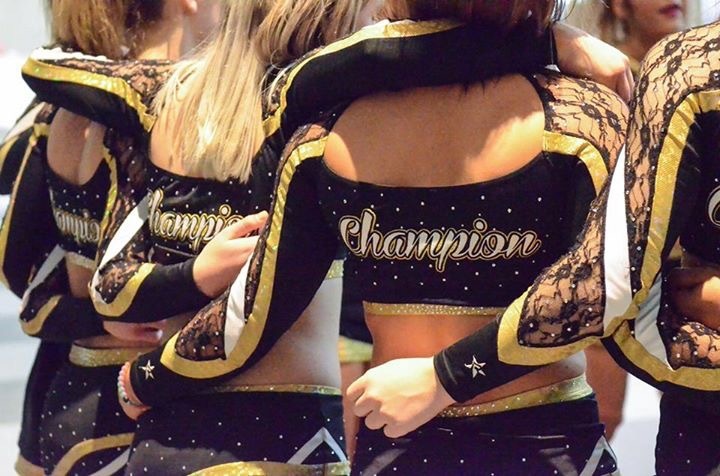 The tumbling time blocks for both options are the same, parents/athletes just need to register for one of the options on through our Parent Portal at https://app.iclasspro.com/parentportal/championcheer! Youth Beginner Classes are 1 hour. All other Beginner through Level 5 tumbling classes are 1 hour and 15 minutes. Here are the class times for each location! We will see you in class! 2018-2019 Prep Teams are Now Forming! Want to compete in the sport of All Star Cheer, but also want less time and/or financial commitment than a traditional All Star team? Our Prep Teams for 6-17 year olds (as of 8/31) are the perfect opportunity for you! Our All Star Prep Teams will have two hours of team practice, plus a tumbling class each week from June 2018-March 2019. The teams will learn a competitive cheer routine which includes tumbling, jumping, dance, and stunting. 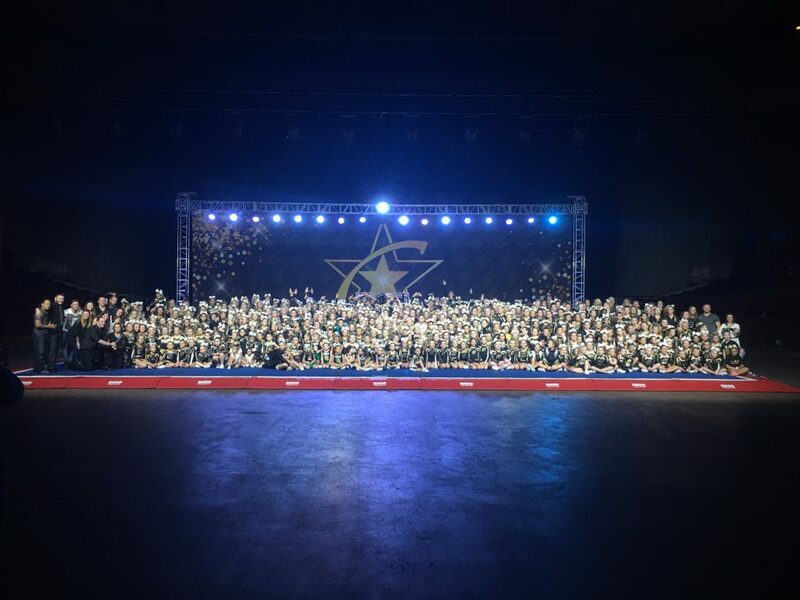 Our All Star Prep Teams will compete at four local competitions in the Prep divisions giving our athletes valuable experience performing in front of nationally known judges and thousands of spectators increasing their confidence and skills throughout the year! Prep Athletes must have a minimum of a forward roll and a cartwheel to be placed on a team. Our FUNdamentals and Novice programs are perfect for those athletes who do not have the minimum tumbling skills, so keep an eye out for information on those programs if you are new to tumbling! Download the Prep Team Information Packet HERE! Ready to register? Simply sign up online! Choose your preferred location in the header bar after clicking HERE. Please register by Friday, May 18th, and then attend our Prep Team Welcome Work Out on Saturday, May 19th from 11 AM-1 PM. Team assignments and practice days/times will be emailed on Wednesday, May 23rd. Practices begin the week of June 4th. Last, but not least, mark your calendar for our Prep Power Day Camp which will be Tuesday, July 31st through Thursday, August 2nd! Please give us a call if you have any questions! For our Southlake location, call 817-251-1546. For our Justin location, call 940-206-4815. We can’t wait to have you in the Champion Family! Team Information Packet and Registration Available Now! Our All Star Elite Club and All Star Elite Select team information packet is available NOW at this LINK. Online registration is now available, too! Click through to our Parent Portal at this LINK. Then, simply choose between our Southlake location or our Justin location by selecting your preferred location in the drop down menu in the header bar and proceed with the online registration! When you are registering, you will choose your All Star Elite track by choosing Club or Select. You will also have the opportunity to tell us whether you want to be considered for teams at CCA Southlake only, CCA Justin only, or either location. Make sure to use the promotional code CCA22 to get a discount on your evaluation fees simply by registering early ($35 discount if registered by 4/15)! We are so excited about the future of our Champion Family and look forward to many more years of Building Champions for Life! New Programs Available for the 2018-2019 Season! Pick Your Program! Join the Champion Family! Season 22 will be here soon, and we have some amazing things in store for you all! In accordance with the new USASF Athlete Development Model, we are introducing new team programs for the ’18-’19 season! The Athlete Development Model introduces stages for athletes to discover, learn, compete, excel and thrive in All Star in ways that encourage a lifelong connection to the sport! All Star FUNdamentals ~ Discover. Learn. Grow. All Star Novice ~ Challenge. Explore. Elevate. All Star Prep ~ Train. Compete. Succeed. All Star Elite Club and All Star Elite Select ~ Achieve. Excel. Master. You can get more information about each of our new programs HERE. Each program will have a full team information packet that will contain even more detailed information including schedules and pricing. Information for our All Star Elite programs is available now. Team information for our All Star Prep program will be available soon followed by information for All Star Novice and then All Star FUNdamentals. We can’t wait to have you in the Champion Family!